Many people come to Phuket on holiday and want to stay for longer. Unless you have independent means, this means that you will need to find a job, which is often not as easy as you might think but can be very rewarding. and certain types of manufacturing businesses. (3) registration through the Treaty of Amity (if you are an American citizen). For a small business the above regulations often mean that it is not possible to set up a wholly foreign owned business in Thailand, and most investors choose to form a Thai company. The majority of foreign investors will form a private limited company. This is due to the fact that not only are the shareholders’ liabilities limited to the amount of the shares they possess, but a private limited company also allows separation between investors and management. A private limited company requires a minimum of three promoters and must file a memorandum of association, convene a statutory meeting, register the Private limited company, and obtain a company income tax identity card. – and evidence of the need for the number. Limited partnerships, registered ordinary partnerships and limited companies pay corporate income tax at the general rate of 30 percent of their net profits. The main tax office is in Bangkok, but there are Revenue Department office branches throughout Thailand. The Main Office also has English-speaking personnel who can help with filing taxes, general information or to locate a branch. Note: living in Thailand does not necessarily exempt a person from filing tax returns and paying taxes in their home country. Although a person may be exempt from paying taxes if they earn less than their government’s tax thresholds, filing a return helps to avoid any problems in the future. The relevant Embassy will have the appropriate forms and regulations for its country’s taxes. With a few exceptions, all foreigners engaged in any kind of work in Thailand must hold a valid work permit. These are issued by the Department of Employment, part of the Ministry of Labour and Social Welfare. The term “work” covers both physical and mental activities, and is defined as “working by exerting one’s physical energy or employing one’s knowledge, whether or not for wages or other benefits”. Working without a valid work permit even for a day is a criminal offense. Employers who violate the law face fines of up to 60,000 Baht and/or jail terms of up to three years. 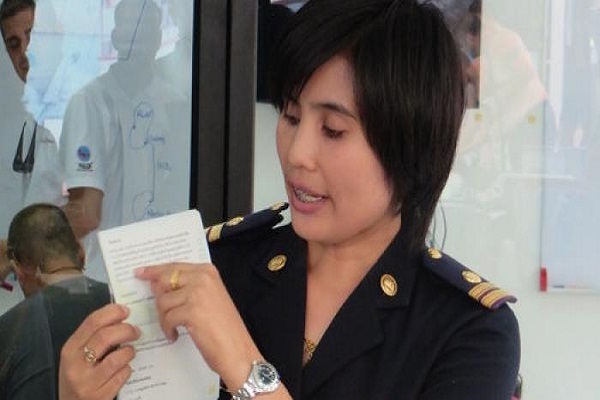 Foreign employees found in breach of the law can be jailed for up to three months and/or fined up to 5,000 baht. There are a few types of work that are reserved for Thai nationals. These are mostly related to manual labour and the production of handicrafts but also include jobs such as hairdressing. Once you have a work permit, you can work and run a business legally, receive income from your business, open a Thai bank savings and checking account, apply for a Thai credit card and bank loans, sign up for a telephone line or mobile phone contract, import your personal belongings to Thailand, purchase a car or motorbike in your name, and apply for a one year visa extension. You will also be eligible to pay Thai income tax. However, you still cannot own land as a foreigner. Foreigners are able to work in Thailand on a one-year basis. Permits must be renewed before expiry. The validity of a work permit depends on the holder’s immigration status. Holders of transit and tourist visa are not permitted to work. Unless you have a non-immigrant visa approved for by the Board of Investment (BOI), you will still have to make the obligatory visa run every 90 days. Your employer should apply for the work permit on your behalf. Thai law places a quota on the number of foreigners allowed to work at a company based on a number of conditions. These range from ratio of Thai staff to foreigners to the amount of the company’s registered capital. Many people come to Phuket on holiday and want to stay for longer. Unless you have independent means, this means that you will need to get a job. Teaching English is an obvious option and is relatively easy to get into. You need to have a degree in most cases and English teaching qualifications such as TEFL and TESOL will definitely help. If you want to find a fairly well-paid job it helps to have skills and work experience that are hard to find locally. There are a growing number of business operating out of Phuket and skills such as computer programming are in demand. Of course you won’t be paid anything like you could earn back home, but then the cost of living here is so much lower, not to mention the fact that Phuket is an island paradise. Thailand has 2 English language daily newspapers, the Nation and the Bangkok Post. Both have job sections in print and online. Phuket also has its very own English language weekly newspaper, the Phuket Gazette. There are quite a few jobs offered in their classified ads section, which is available in print and online. You can also use Facebook Groups for some jobs. The vast majority of employment opportunities advertised in the national newspapers will be in Bangkok or elsewhere and you may have to sift through hundreds to find one in Phuket. The Phuket Gazette is probably your best bet. If you still can’t find something to suit you, why not try emailing your resumé to companies listed in our directory? They may not have known that they were looking for someone just like you. Good luck. One of the easiest ways to get a job in Thailand is to teach English. Ideally you should be a native speaker and hold at least an undergraduate degree. Pay is generally quite low, however, this is offset by the fact that you won’t be working a lot of hours, which will allow you to either have more time to enjoy your stay in Phuket or provide some private tuition to earn some extra cash. Native English speakers with a minimal bachelors degree (in any discipline) and an ESL, TEFL, or other equivalent teaching credential will have priority pick of the better paying and more exclusive gigs at private and international schools, as well as luxury hotels and resorts. Though prior experience teaching English is a plus, it is not mandatory for most jobs. To obtain a secure teaching position in Thailand, you will normally need to obtain a teacher’s license as well as a work permit. Your employer should apply for these on your behalf. Note that working without a work permit is illegal and punishable by fines and deportation. It is not impossible for those without a degree or teaching certificate to find teaching work in Phuket (and Thailand in general), and most likely any work found will be illegal. In the past any one with white skin and a native English accent had no trouble finding work, though government crackdowns on unqualified foreign teachers (lacking credentials and work permit) throughout the kingdom are more common. If caught repercussions could mean hefty fines, deportation, being blacklisted, or all of the above. Teaching jobs are usually advertised through the usual channels such as newspaper classifieds. Most teaching jobs will be in and around Phuket City. The most common arrangement of teaching jobs in Thailand is with a language school-agency, which typically offer private tutoring and small classes-courses on the evenings and weekends. Classes range from primary level students to adults, and/or teaching weekly classes at one of various public and private primary and secondary schools in different locations throughout the week. The agency or school which employs you may provide you with a set curriculum and materials and resources to assist you, but you may even be asked to develop specific lesson plans or in some cases, devise an entire curriculum. Often, teachers find themselves having to adapt-improvise with their own resources and materials, particularly when the provided curriculum consists of nothing more than a photo copied book. Generally, the younger the students, the more work, planning, and patience are required. Songs and dances are a hit with the young ones, while team games are popular among all ages. Those who have had no prior experience or exposure to teaching may initially find themselves overwhelmed when thrown into a classroom full of 50 Thai students. A teaching certification course, which includes adequate teaching exposure and practice will not only increase your chances of a better paying job, but will also provide you with enough confidence and preparation to be ready for the Thai classroom. If you decide to become a teacher, it is very important that you are conscious of how you present yourself in public. In Thailand, teachers are held in high regard, thus it is probably not a good idea to openly be seen bar hopping, particularly near your work place(s). Teachers who fail to adhere to the acceptable expectations of grooming, sanitation and mannerisms will be frowned upon and may even find themselves suddenly without a job. One such teacher was terminated simply for writing about her “party lifestyle” in her blog.